Red hots cinnamon candy. Tiny bite size chewy candy bursting with a spicy cinnamon flavor; also known as cinnamon imperials. A classic candy dating back to the 1930s and a very popular candy from the 50s. 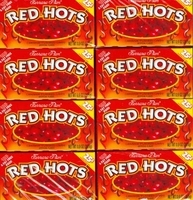 Each box of red hots has 24 .90 oz mini boxes. Here is a great recipe for Spicy Red Applesauce using Ferrara Pan Red Hots. SPICY RED APPLESAUCE The more cinnamon red hot hearts you add, the spicier it will be! Make this ahead of time, and put in the fridge until dinner. Directions: Cut up apples and put in a saucepan with water. Cover pan, cook slowly until tender (test with a fork, it will vary depending on the type of apple). Remove from heat. Add the Red Hots, beat with a spoon to dissolve. Chill. Serve with a few hearts sprinkled on top. If you're in a hurry (or don't like to cook) buy a jar of applesauce. Put a 1/2 cup of the applesauce in a saucepan over low heat, add the hearts, stir to dissolve. When the Red Hots have dissolved, remove it from the heat, let it cool. Now stir it in with the rest of the applesauce and refrigerate until dinner is ready.